I first got to know about a charlotte cake in one of the recipe pages found in a local magazine. I was attracted to the pretty cake as it looks very elegant with the ring of ladyfingers (sponge fingers), strawberries and chocolate toppings. I have been wanting to try it, but it took me a while before I could manage to get ready-made sponge fingers. I knew I have to rely on store-bought ones as I would never be able to achieve the standard and even shapes of the biscuits if I were to make them from scratch. Thanks to fellow blogger, Elyn, for telling me where to get them. Even then, it took me three separate trips to different branches before I spot them on the shelves! I was planning to make a strawberries version, but was not able to get any strawberries from the nearby fruit stalls. Since there were several types of mangoes available at the stalls, I came up with this mango and peach version. The recipe that I have on hand is for a mousse filling, which is made with eggs, milk and thicken cream. I didn't like the idea and went on to use the same yogurt cake recipe instead. 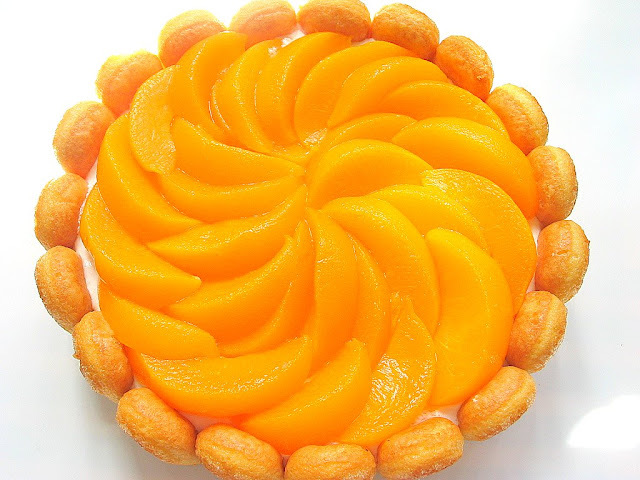 I replaced the plain yogurt with a low-fat peach & mango flavoured one and added in chunks of fresh mangoes in between the filling to enhance the taste. I manage to assemble the cake without using a cake ring or a springform pan. This was done by lining a normal cake pan with a layer of foil, then place a cake cardboard on the foil inside the pan. Once the cake was chilled, I simply lift up the cake from the pan and removed the foil. I also made a batch of cut-out cookies for my friend's kids...there is a layer of Poohs and Piglets hiding underneath the Mickeys and Minnies. Hope they'll like them! Dip sponge fingers in syrup from canned peach syrup. Arrange flat side around inside and base of prepared tin. (If you prefer the sponge fingers to be crisp and crunchy, you may choose not to dip them in the syrup). Sprinkle gelatin over water in a bowl. Add in sugar and stand the bowl in a pan of simmering water, stir until dissolved. Set aside to cool. Mix yogurt and vitagen and add in cooled gelatin solution. Mix well. Whip non-diary whipping cream till mousse-like. Add in the yogurt mixture to the whipped cream and mix well. Pour one-third of filling over the biscuit base. Top with mango chunks, then remaining filling. Refridge till set. Decorate top with peach slices. Your friends are very lucky :) Your charlotte cake looks absolutely delish...and the cookies too! You're getting better each day! This cake is so pretty, so professional looking :)Can the cake withstand room temperature? Hi Elyn, this cake looks pretty because of the sponge fingers and peach slices...has got nothing to do with my baking skills...haha! I am sure you can come up with something pretty too! I think it can withstand room temperature, but it is best eaten chilled. This cake is bakery worthy! It looks so fresh and springy. Lucky freinds! your Charlotte Cak is really pretty, i'm so tempted to make one soon. The cookie recipe is posted in my earlier post here . happy baking! I am getting more and more hungry browsing through your recipes!! I'm not familiar with this "vitagen" product; I don't believe I've ever seen it before. Is there a generic name for the product? Would I be able to replace it with something else? Jo, Vitagen is actually a cultured milk drink...almost like yoghurt drinks. 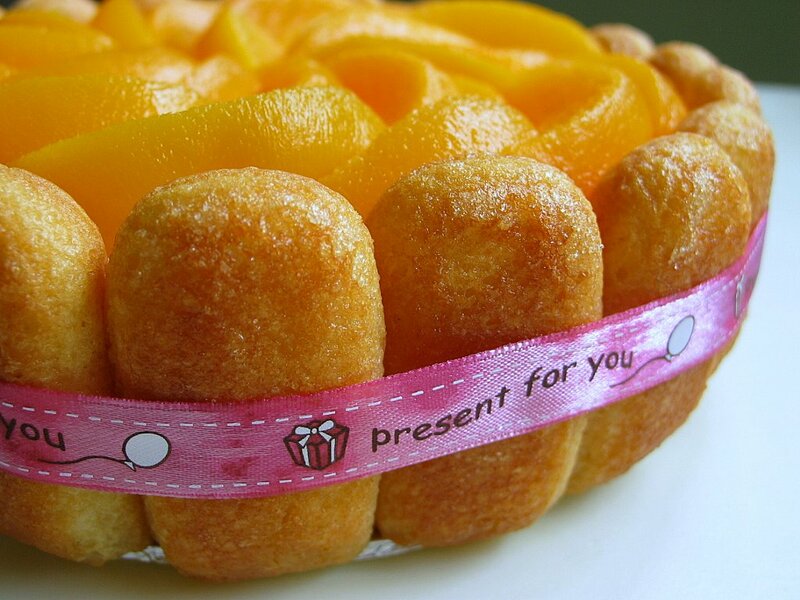 your Mango and Peach Charlotte Cake looks so tempting!!!! 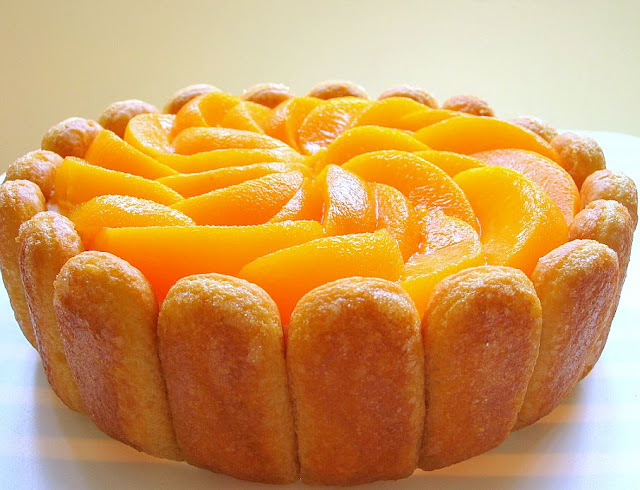 my mom is a peach & mango lover & i would like to make this cake for her during this coming mothers' day. one query. if i arrange the sponge fingers on the base of a tin, will the sponge fingers 'fixed' onto the tin? i went to NTUC trying to get the sponge fingers but i could not find them. can we find this sponge fingers under the biscuits section? Hi Melody, that's very nice of you to make a cake for your mum! No worries, the sponge fingers will not fix onto the tin. You can try carrefour...it's usually at the biscuits section. Hope you can get the sponge fingers! Where can I get non-dairy whipping cream from? Hi Shopnic, u can get it at Phoon Huat (the brand is Redman), or Cold storage (brand is Pour & Whip). It's really the thots that counts! I won't mind eating a burnt cake if it is baked by my boys. Thanks for your encouraging words...it means a lot to me...especially on days when everything seems so bleak. 1) what do you mean by having the sponge fingers biscuits halved crossways? i didn't realised that during my first attempt. 2) when you mentioned about arranging the sponge fingers on the base of the prepared tin, i believe you meant we covered the base with sponge fingers right? but how can we ensure the sponge fingers are tightly laid on the base? i realised i could not filled the base as there are some 'loop holes' & could not fit tightly next to each other. 3) "Arrange flat side around inside and base of prepared tin" - do you mean the sponge fingers with sugar facing outside or inside (side) & upward or downward (base)? 1. I meant cutting the sponge fingers into two halves. 2. There will be small gaps here and there in the base, but it's ok. You can cut small pieces of sponge fingers to fill up the gaps. 3. Sorry since I am away, I am not sure whether it is the sugar side that is facing out! You can just arrange the sponge fingers so that the flatter side faces inside for the side, and facing upward for the base...the reason I did this was try not to avoid the gaps mentioned above in your 2nd question. Hope I have answered your questions? Side notes on the lady fingers, place your day to day spong cake batter in a zip lock bag, cut & corner & pip on a marked, 3" line on a peiece parchment, dust w/ powdered sugar. Bake in 400 F oven for roughly 5-10 min, let cool & use. You can use it as sheet band or cut them to logs to have the ladyfinger look. I find this make the charlotte & Tiramisu looks way better then the store brought (not so chucky & fit nicely). I wonder where I can buy the lady's finger sponge biscuit to make the delicious-looking Charlotte Royal made by you. Please help as I'm unable to buy them at the supermarkets that I frequent. Thank you for your help. Hi Janet, I assume you are a local? You can try Carrefour (look for them at the biscuit section). Hope you are able to get them...if not you can also try Phoon Huat. I tried making it last night but I can't get the whip cream to look like mousse. After half an hour of whipping, it still stay the same, do you know what happen? i would be making this cake in a week for my friend's bdae.. but,a few questions, we dun have vitagen here in aust, is there a substitute? and could i replace the non-dairy whipping cream with thickened cream from my local supermarkets? & the 1/2 sponge fingers on the side, are they also dipped in the syrup? & if yes, were they cut before or after the dipping? =) thk u so much for your help! lovely recipes..
You may try replacing vitagen with yoghurt drinks. Yes, you can use thickened cream instead, however, the cake will be very much richer in taste. As for the sponge fingers on the side, you can choose not to dip them in the syrup so that they stay crisp. and if you want to dip them in the syrup do cut them before dipping. Do take note that the sponge fingers get soggy very quicky, just gently dip them in the syrup, you can also use a brush to brush on the syrup. Hope this helps. I managed to do 2 tiny ones(for my friends bdae 2mr) on pie trays instead... really ez... but i omitted the yogurt & just opted for cream, my friends arent too crazy over yogurt... but my decoration was really messy.. i gt cream all over... & how did u manage to make the peach slices look soo pretty??? did u trim the slices??? i had cream sticking out at almost every part!! I didn't trim the peaches, I used canned peach slices. Maybe your cake (filling) was not set before your decorate the top with the peach slices? If the filling is more firm, it will be easier to palce the slices. I just tried this out but all the finger floated when I poured in the filling. The filling is kind of waterery after I added in the yogurt mixture. btw, i used dairy whipping cream instead of non-dairy as i cannot find this. Could this be the problem? I did whip the whipping cream till mousse like before added in the yogurt mixture. Tomorrow the birthday girl will be very happy to see this pretty pretty cake. I decorated with some strawberries too beside the peach slices. Thank you for your recipe and i really enjoy a lot reading your blog. This is the second week I tried your recipe. Last week i tried the Milo Doggie Cookie with my 2 girls and they loved it so much. In fact everybody who ate the cookie said it was nice! Hi Wong, I am so glad to hear that everything went well :) It is very kind of you to make a cake for your friend. It must be fun making the cookies with your girls. and Happy Birthday to your friend! Thanks for sharing the recipes on your blog. 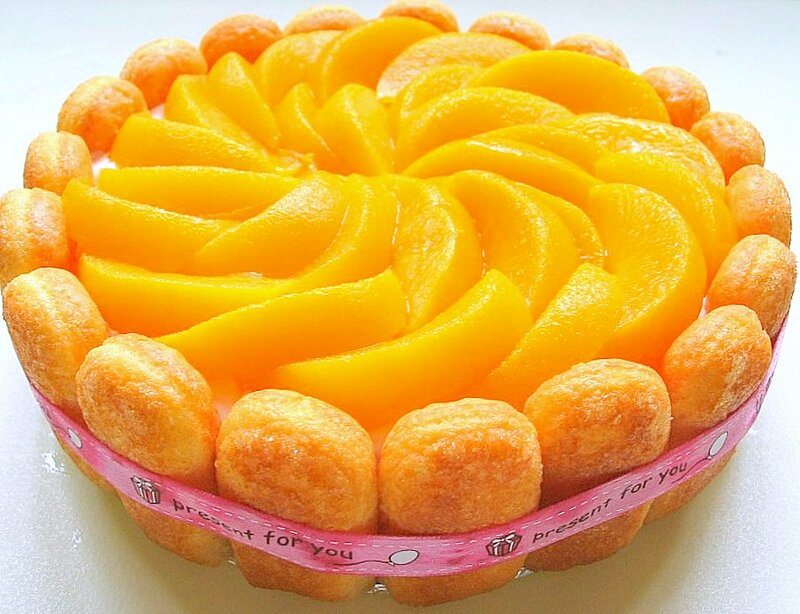 Have tried the jellycheese cake, mango pudding and most recently, the mango & peach charlotte cake. For the mango & peach charlotte cake, the filling turned out very soft and abit watery. is this suppose to be this way? Hi Shan, thanks for trying out my recipes, hope you like them. The filling for the mango & peach charlotte cake is soft but not watery. Maybe you can let the cake chill in the fridge longer to make sure the filling is really firm before serving. Hope this helps. where did you get the mickey mouse??? Hi, I got the cutters from Tokyo. Hi HHB, how do you line a normal cake pan with a layer of foil, then place a cake cardboard on the foil inside the pan. Can you help to elaborate further? I can't imagine how to put the aluminium foil into the pan. 2) Won't the aluminium 'break' when you take it out from the pan? I can imagine the cake weight causing the foil to 'break' when pulling the foil out of the pan. 3) Where did you get your cardboard from? Can advise? I got the cake board from SKP (there are many branches), have you heard of it? It sells mainly plastic containers/paper cups/plastic bags etc. You can also get the cake board from Phoon Huat. The foil will crease, but not as though you purposely crumble it up like paper, u get what I mean? and it won't tear off. 1st, you need to make sure the foil it big enough to cover the pan and leave around 2 inches over hanging the side. Next, invert your normal cake pan (base facing up), and put the sheet of foil on it. 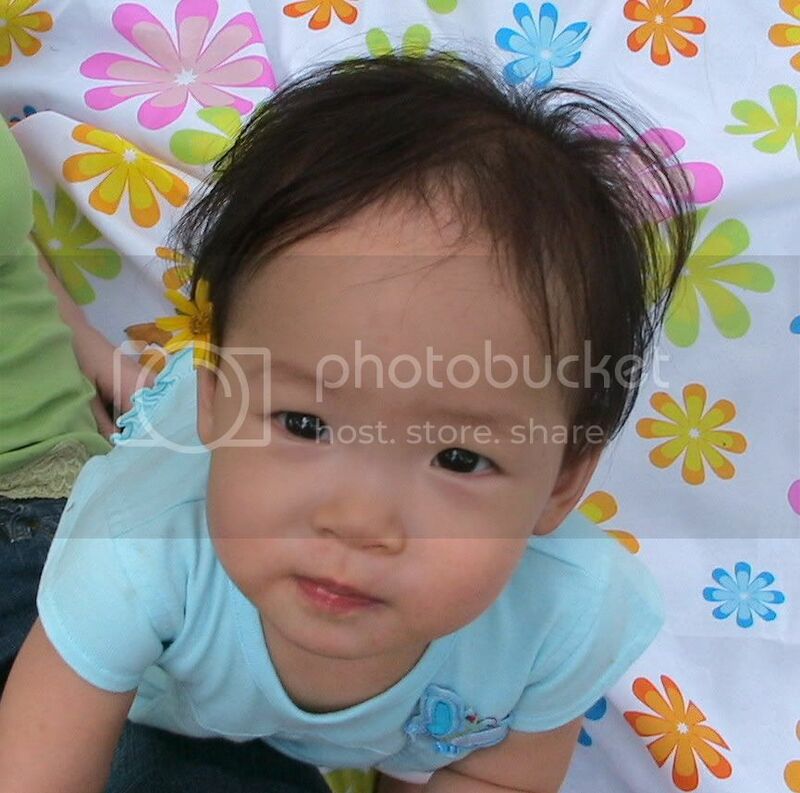 Then gently (since you said you are a bit choi lor, like me!!) 'mould' the foil around the pan. Then remove the foil (it should look like a 'round pan' now), invert your cake pan, and place the moulded foil into the pan. This way, the foil won't crease too much. Then you put the cake board inside. When you need to lift up the cake, you do it quickly, get help if you are not confident. 2 pair of hands is better than 1. Simply lift it up and place it on your table. Then carefully lift up the cake using the cake board, and transfer it to your serving plate. this cake? If yes, do note that the sponge fingers get soak up very fast, so the best is to use a brush to brush on the syrup, and only on the sides that is facing inside the cake. - Crumbling the foil unknowingly (like a paper) so that I can put it into the pan. Thanks for the step-by-step, help me to visualise better and I will try it soon and let you know! Yes, I am intending to do this cake. The steps look straight-forward and BEAUTIFUL. Another question, how do you tell if it is whip till mousse stage? Any sign/symptons to tell that the stage is reached? Cardboard and sponge finger tips: Noted with thanks! hi homegirl, it is much easier to whip non-dairy whipping cream. You just need to make sure you only bring the cream out from the fridge when you are ready to whip it. Use a low speed initially (to avoid splattering), when the mixture starts to thicken (but still watery, maybe around 1/2 a min), u can turn to medium speed. Go on for another 1 to 2 mins, the cream should turn mousse like, ie u can see the 'marks/trails' left behind by the whisk. When u lift up the whisk, the cream should drool a little (just like beating egg whites to soft peak stage). If you are not sure, you can whisk it for another 1/2 min or so, there is no worry of over beating it (unless you are whipping Dairy cream). In Step 4, after adding the yoghurt mixture to the whipped cream, use a spatula to fold in the mixture. The final mixture is more 'pourable' than 'spoonable'...hope u know what I mean. HHB what is Vitagen? We don't get it here. Is there any substitute? Hi Lara, vitagen is somewhat similar to yoghurt drink, can you get yoghurt drink? We get yoghurt here. In fact I make yoghurt at home. Should I use it plain or flavour it? Thanks. Hi Lara, you need to use yoghurt drink, the consistency is like milk, not thick as yoghurt, hope you know what I mean? You can use either plain or flavoured yoghurt drinks. Thank you for your lovely blog. I've been looking at your Tiramisu Charlotte Cake, and this question has been on my mind for some time now. Doesn't the ring of sponge fingers fall apart after the cake was lifted from the baking tin? Does it work without the ribbon? Thanks again!I love looking throught your blog!! 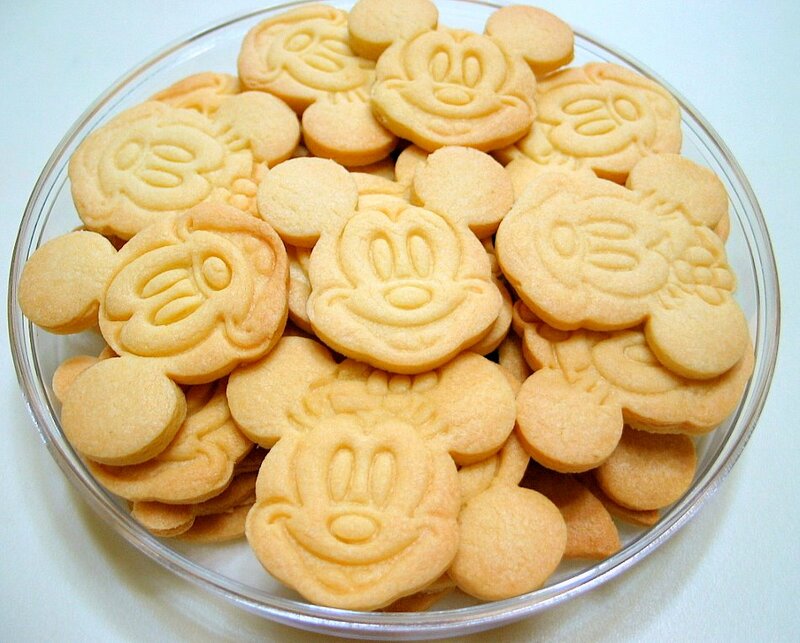 Where did you get your Mickey cookie cutter from? Hi Renette, my husband bought them from Japan. Hi Flynn, for the sponge fingers I used this brand 'Vicenzi', you can get it from Carrefour, Cold storage. I used Marigold fruit yoghurt. Also, if I add thicker or more concentrated gelatin solution, is that possible, will it help make it harder (like those jelly mix that sets without fridge) ? Hi, Congrats on your engagement! I am afraid you can't leave the cake out the whole day since there is yoghurt and whipping cream. Hi, leave it to set in the fridge for at least 4 hours. Hi! I'm working on a Charlotte cake recipe round up for The Huffington Post Taste and I'd love to feature your recipe. Please contact me if you're interested. Thanks! I wanted to email you but couldn't find your email. 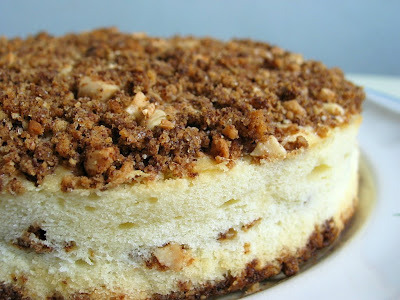 I used this recipe to make a mother's day and received wonderful reviews from my family. I am documenting my bakes on my blog and would like to share this recipe. Will this be ok with you? I always credit back the source of recipe that I took from. 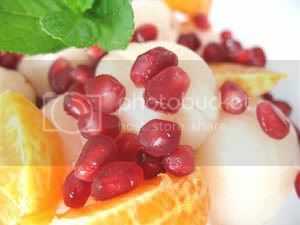 Hi, you are welcomed to share this recipe, I just hope that you would link it back to this post. Thanks.